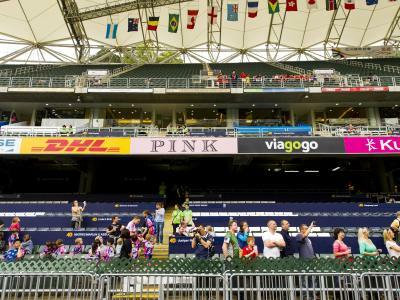 The 2016 Summer Olympics in Rio de Janeiro sees the debut of Rugby Sevens. There is no greater global stage for any sport than the Olympics, and rugby sevens will now have its place in the spotlight. 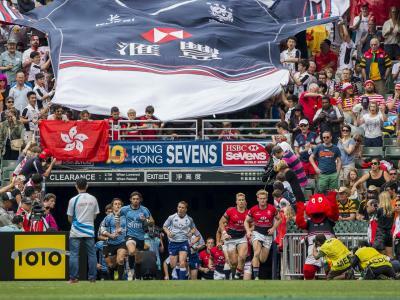 This is an incredible expansion for the sport – and we're happy to make Hong Kong a part of it by hosting the world's first Asia Rugby Sevens Qualifier! Sponsorship of this tournament are tailored to each client's needs, within three levels of sponsorship (there are no 'standard' packages). Celebrate the exhilaration of the Olympic Qualifier withthe Stadium's premium hospitality option. Glass fronted, air-conditioned private rooms/terraces, each with a private bathroom and kitchen will ensure your business guests have the ultimate Sevens experience as they enjoy all the electrifying action on the pitch. A wide range of food and beverage options can be purchased directly from the official Stadium contractor, The Holiday Inn Golden Mile Hotel or pre-ordered in advance to cater to any taste. With unobstructed views of the pitch from tiered seating that can comfortably accommodate 60-70 people, and with exclusive rights to brand the suite for your hospitality purposes, our Hong Kong Stadium Suites are clearly the ideal place to combine business and pleasure. All suites Include executive level tickets and executive level passes. Entertain your guests and staff in a Stadium corporate box, and let them experience the unbeatable sights, sounds and excitement of live rugby action. These reserved blocks of open-air premium seats are located on the Executive Level, directly overlooking the pitch, ensuring you won't miss a single moment of the action throughout the weekend. A wide range of food and beverage options can be pre-ordered or purchased directly from the stadium official contractor, The Holiday Inn Golden Mile Hotel. Corporate Boxes are either 20, 24 or 40 seat capacity, with unobstructed views of the pitch, including tiered seating. Treat yourself, your friends and guests to an unforgettable weekend with Hong Kong Stadium's Executive Level Individual Tickets. Made available with individuals and smaller groups in mind, these seats are located in a reserved block of open-air premium seating alongside the other corporate boxes on the executive level, with the same exclusive access to facilities. The seats directly overlook the pitch, ensuring your guests won't miss a beat of the action, and allowing them to cheer on their favourite team in style. A wide range of food and beverage options can be purchased directly from the stadium official contractor, The Holiday Inn Golden Mile Hotel. Executive Level Individual Tickets can be purchased individually, and up to as many as tickets as you need.